On holidays in France, and you are teeing off on one of the most scenically beautiful golf courses imaginable. The weather is magnificent, and it’s a ‘feel good’ day. Your elegant and interesting boutique hotel is serendipitous and charming. For couples where one partner wants a holiday in France with golf and the other a wonderful place to stay at, a fascinating destination, and a touch of luxury, Provence is the ideal place to be. This is an idyllic stretch of country in France’s south-east, with a coastline that borders the Mediterranean Sea and includes popular resorts such as Nice and St-Tropez. Today this dramatic and varied terrain is a magnet for discerning visitors. The sleepy rural village of St-Remy is perfectly situated for sightseeing in the Alpilles countryside, where plants for the traditional herb shops – herboristeries – are grown. The 16th century astrologer and physicist, Nostradamus, was born here, while in the 1700s Van Gogh arrived at the Clinique St-Paul, between St-Remy and the ruins of the Greco-Roman town of Glanum, after mutilating his ear. Two of St-Remy’s grandest 15th-16th century mansions have today been converted to museums. The Hotel de Sade, formerly the home of ancestors of the Marquis de Sade, displays Roman artefacts from Glanum while the Musee des Alpilles displays an ethnographic collection. Les Baux-de-Provence overlooks the Camargue – flat, largely uninhabited landscape made up of substantial areas of pastures, lakes, sand dunes and salt marsh, and which forms one of the main wetland areas in Europe. The village, perched on a spur of the Alpilles, contains the ruins of a 10th century citadel built by the Lords of Baux. These warriors also had a romantic side, courting noblewomen using poetry and songs in the troubadour Courts of Love. The history of the citadel is now on display at the Musee d’Histoire de la Citadelle, located in the 14th century Tour-de-Brau. Les Baux is Provence’s most dramatic fortress site and is today a popular tourist destination. 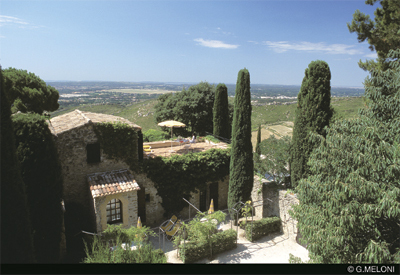 Les Baux is also home to the Oustau de Baumaniere, a 19-room, 11-suite hotel that was fully-renovated in 2002. This is one of two Relais & Chateaux in this area of Provence providing a splendid combination of tradition and modern comforts and which are an ideal base for a golfing holiday in the region. 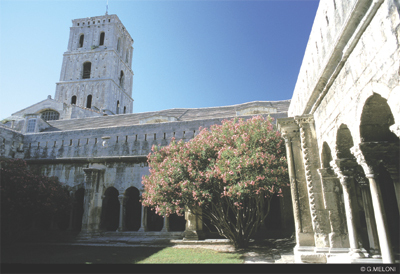 The other is the Abbaye de Saint Croix, a 12th century abbey at the base of the Alpilles, which was restored in the 1960s and 1970s and today offers four star hotel accommodation. It is conveniently located within 30-45 minutes of Les Baux, Avignon, Arles and Marseilles. The rooms are air-conditioned and are serviced with telephones, satellite television and a minibar. Four suites are also available, and you will enjoy the best regional dishes when dining here. But for the golfer, there is also another reason to visit Provence – some of France’s most interesting and challenging golf courses can be found in this region. And the Abbaye de Saint Croix will make arrangements for you to play at any of these. Take a moment to breathe in the fragrant Provencal air while teeing off at the Pont Royal, just thirty minutes down the road from both the medieval city of Avignon and Aix-en-Provence, which was once the capital of this region. Designed by Severiano Ballesteros, this golf course is accessible to amateurs while providing a challenge for professionals – both the men’s and women’s professional tours play here. The par 72, 6303 metre (black markers) course opened in 1993 and features broad fairways and sloping greens. The water hazards mirror the immaculate scenery of Pont Royal and though they are placed throughout the course are unlikely to cause any serious problems. Services on offer here include a golf academy and golfcart rental for those keen to hit the fairways, while the rest of the family can be kept busy with leisure activities including horseback riding, tennis and swimming. There’s also a restaurant and children’s club in the three-star golf course hotel on site. A manicured gem set amongst untamed country to the north of Mouries village, this golf course offers holes as diverse as the surrounding land. The 6161 metre ‘Domaine de Servanes’ course was the brainchild of designer Mr T. Sprecher The uninitiated may find their golf balls disappearing into an olive grove situated down from the first holes. Elsewhere on the course, straight fairways interchange with dog-legs, flats are contrasted with slopes and shady stretches give way to open, sunny expanses. Both flower beds and bunkers provide useful landmarks to negotiate play around these 18 holes. The Clubhouse is sheltered by the left wing of a country house that dates back to the 1700s. It was given a new lease of life when renovations were undertaken as part of the development of this golf course, which opened in 1988. Golf de Servanes is just ten minutes from St-Remy and a half-hour drive from Avignon. Golfcart rental is available and a restaurant and bar at the course provide an ideal place to recount stories of that perfect putt or drive. The first hole at the Golf Grand Avignon is a manageable par five. The lake on the left is too distant to pose a problem but watch out if you slice the ball too far to the right – there are stands of trees on this course just waiting to claim an errant golf ball. But this all contributes to the picturesque landscaping here. Architect G. Roumeas designed a challenging as well as aesthetically pleasing 18 holes. Holes two to six feature four par fours requiring a short second shot while at the par three a water hazard offers a potential obstacle. Pause to take views of ‘Mont Ventoux’ while playing the eighth hole. This 1,909 metre mountain, otherwise referred to as the ‘Geant de Provence’, rises above the Golf Grand Avignon course, which is conveniently located just ten minutes east of Avignon. After playing a round you can relax by the adjoining hotel’s swimming pool, or indulge in a massage – just two of the additional activities provided here. Other services offered include a restaurant and golfcart hire. 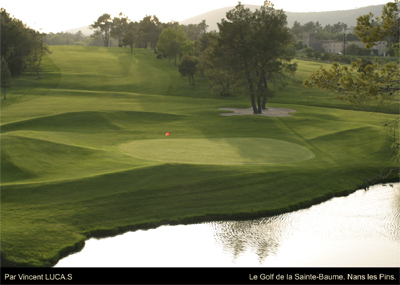 Do not miss Sainte Victoire Golf Club if you are planning a golfing holiday in Provence. Architect Michel Gayon created this course, which contains two tiered greens and a number of notable water features on holes eight and eighteen as its major obstacles. His combination of technical challenges with visual stimulation makes this a course well worth playing. As seems to be the case with most of Provence’s golf courses Sainte Victoire is also superbly situated amongst the region’s natural beauty. 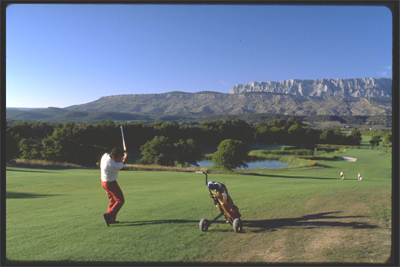 Here, the Sainte-Victoire mountain provides a stunning backdrop to every hole. Also a feature is the 17th century chateau de l’Arc, around which the golf course was constructed. Today, it operates as a lavish four-star hotel with two restaurants. Sainte Victoire is easily accessible from Aix-en-Provence, which is fifteen minutes away. It is also just half an hour away from Marseille – France’s oldest major city and leading port. The par 71 course opened in 1985 and offers services and amenities such as a swimming pool and golfcart rental. 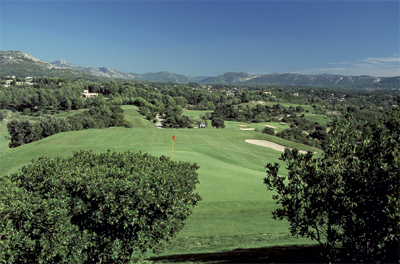 A short ten-minute drive from the centre of Avignon will take you to Golf de Chateaublanc. The course is the result of the combined visions of French golf-course designers Thierry Sprecher and Gery Watine. One of the outstanding aspects here is the use of water, which features in twelve of the eighteen holes. 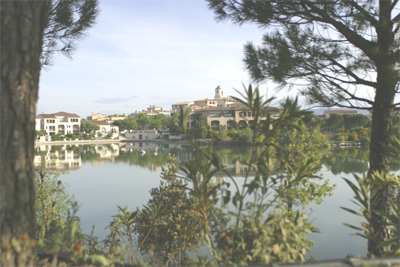 In fact 2.5 acres of water sits in the ponds, ditches, cascading ponds and reservoirs at Golf de Chateaublanc. The result is a tranquil environment shared by golfers and wildlife that includes Florida turtles and wild ducks. There are also in excess of thirty sand traps stationed around the small greens. An insider’s tip - watch out for the sloping greens on the sixth, fourteenth and fifteenth holes. The third hole is also one to watch. This par three is only 150 metres, depending on the tee, but you will need to clear a water feature to reach the little peninsula that contains the green. Golfcarts can be hired here and there is also a restaurant on site.